Plan9 Incubator has recently announced that it will be hosting the national (Pakistan) and regional (West Asia) final of Get in the Ring competition. The national final of the pitch competition will be held on 19th November 2015 at Arfa Software Technology Park, Lahore. The incubator is hosting the national final for the second time around but it would be its first time to host the regional final as well. 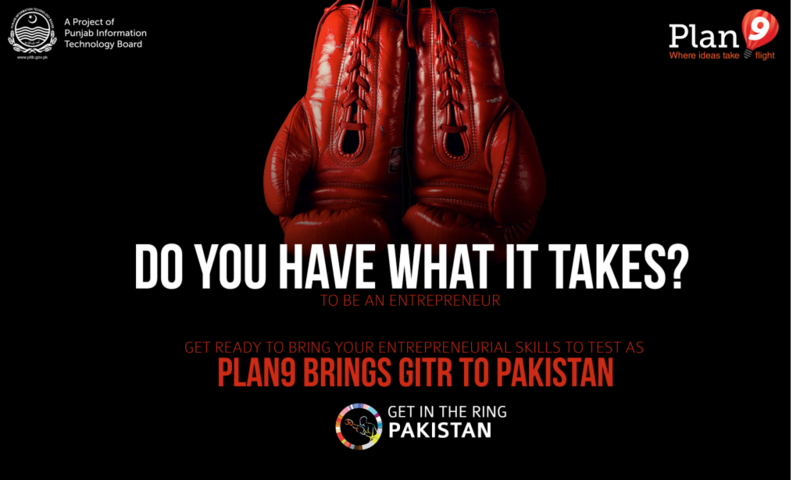 Get in the Ring is a global pitch competition held in 80 countries where startups are scored on their team, achievements, business model & market and their financials. It is held globally by Get in the Ring foundation to hunt the most promising startups in 3 different weight-classes; light, middle and heavy. The competition comprises “live battles” inside a boxing ring where two startups face-off at a time in the form of 5 rounds of 30 seconds each. Every round will end with a Q&A session. Based on the pitch, the startups will be given scores on following five rounds: team, achievement, business model & market, financial & propositions and free style. Winners will be decided with a vote by the audience and the judges. The objective of the event is to bridge the gap between talented entrepreneurs and the opportunities they seek. The challenge provides the startups with a platform, where they find resources, capital and expertise to survive and inaugurate their plans. Through the challenge, the foundation hunts for the most promising startup in terms of potential to contribute to the industry. Each startup after qualifying through local, national and regional rounds will proceed to the international finale where the global winners will be announced. Each startup has to perform exceptionally well in all five rounds, in order to qualify. The judges will critically examine the performance , the stance made and the idea presented. Lastly, the selection will be made and the best in the league will qualify for the next round i.e. regional round. Must fit into one of the three weight classes i.e. light , middle and heavy weight . It must have an innovative and salable business idea/model. To register for the event, participants (Startups) need to fill up the form here, Startup Application. If you want to go at the event as an attendee, you can register for the event by filling up the form here, Audience Application. Registration for the national final will close on 6th November 2015. In the coming January 2016, the regional final (West Asia) will be held for the first time in Pakistan hosted by Plan9 with 64 countries participating. This is a notched up effort by the largest technology Pakistani incubator. Stay tuned with TechJuice for more updates.